There was an important event which was beamed into the homes of millions last month and which engaged the intrastate inequality debate. It captured the interest of the nation and divided it. Of course, it was the introduction of a new Sesame Street character, Lily, a 7 year old character who is, "food insecure", meaning that she's on the American poverty line. In fact, the introduction of Lily to Sesame is probably more important in the long-term than the now infamous Occupy Wall Street, simply because Lily's character will infuse the next generation of Americans with a normative expectation of inequality and poverty for a certain percentage of the population. Lily will probably be cast as a really moral, effervescent and helpful character, thus showing America that some may be poor, but in fact, they're happy and good people so let's get on with everything. Perhaps in a later episode she will be sold a sub-prime trailer - at 67 times her annual income - in a nondescript trailer park in Kentucky, where Oscar will visit her periodically and stay in her trash can. 2. Occupy seek to occupy the space of those they campaign against, the stronghold of "capitalism", Wall Street, or in London, the Stock Exchange. 2iii. 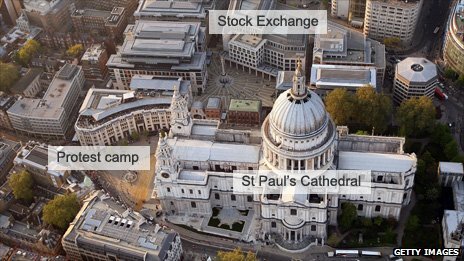 They find themselves confined, respectively, to Zuccotti Park (NYC) and the West side of St. Paul's Cathedral (London). In the case of the latter, their plan to occupy the London Stock Exchange (the twitter hashtag is occupyLSX) was vetoed by the police. 3. Capitalism is not found in the park and to occupy a small area of St Paul's is to lend a strangely element of religious confrontation to the mixed messages (One of the larger tents there is painted with "Free Abdullah Ocalan", which is not an anti-capitalist message, but a political one. And the two heads that have fallen are not businessmen but clergymen). 4. To confront capitalism in this way it is necessary to striate its movement, to make 'swiss cheese' of its smooth, seamless operations. This is singularly not achieved by the Occupy movements. Bankers walk past the encampment at St Paul's in the morning, laughing. No street is barricaded, no door is barred. The media, the 24 hour news-crew keep the tents there, but it is time to pack up and go home. 5. Capitalism is striating itself, more and more nodes disintegrating, first in Greece, now Portugal, Italy, Spain, to name just European nations. 6. To Occupy, yes, what you have done is important, but go home, re-read "A Thousand Plateaus". You are rapidly become a menagerie, a tourist attraction, an open zoo. Develop doctrine, public relations. Speak to Naomi Klein. You are now, to paraphrase Edward Said, "A living tableau of queerness". Occupy, which began in Spain or Kuala Lumpur depending on the news source you read, has been mimicked in at least 95 cities. The student fees protest in London yesterday (surely a much more meaningul protest) had a tiny breakaway of protestors trying to camp at Trafalgar Square, moved on immediately by police. So why has Occupy struck a nerve? Inequality when a section of society are deprived of the necessities of existence is a disquieting phenomenon but it's survival of the richest unless the masses formulate a coherent response. Moreover, they must pick their battleground - when an Italian restaurant owner and celebrity chef compared bankers to Hitler and Stalin the bankers coagultaed on social media, urging each other to cancel reservations and avoid the eateries, boycott other of the chef's products. The chef was forced into a grovelling apology. The bankers hold sway in areas, that cannot be denied - money talks. Ten percent of British GDP is from the financial services. Indeed, since less than 10% of those employed are in this sector they can justifiably claim to punch above their weight in terms of contributions. Occupy needs to pick new terrain.